This March we honor the memory of those that came before us by alleviating hunger today. In 2012, then Taoiseach Enda Kenny cited Ireland’s generational memory of the Great Famine as inspiration behind Irish aid agencies fighting hunger across the globe. Since the Great Famine, or An Gorta Mór as it is known in the Irish language, millions of Irish people have emigrated from Ireland, and carried that generational memory with them to their new homes. Here in the US, and Arizona in particular, a significant number of Irish immigrants and their descendants have made their mark on their communities. 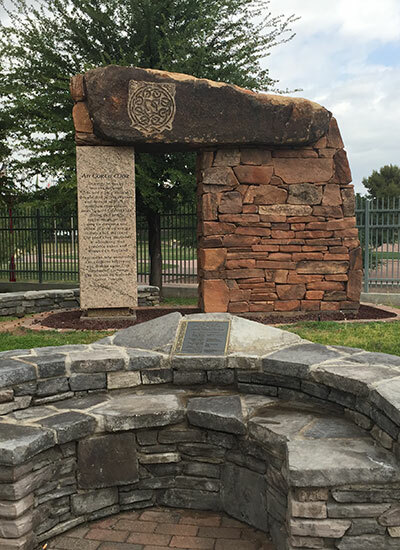 Famine memorials, such as An Gorta Mór at the Irish Cultural Center in Phoenix, can be found all across the United States. As we near the most popular time of year to be Irish, the Irish Cultural Center and McClelland Library ask that you too find inspiration, and help us feed those in need. From February 1st through April 30th the Irish Cultural Center and McClelland Library are partnering with St. Mary’s Food Bank to collect non-perishable food products to help alleviate hunger in Arizona. Donations can be made onsite at the Irish Cultural Center and McClelland Library at 1106 North Central Ave in downtown Phoenix. Receive 25% off a Tour, Exhibit Ticket, or Genealogy Day Pass when you bring in two non-perishable food items for donation between February 1st and April 30th.